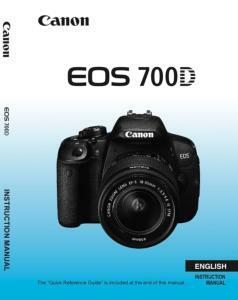 A black-and-white reprint of the original instruction book supplied for your Canon EOS 700D camera. Professionally produced as a high quality, spiral bound A5 book. A black-and-white reprint of the original instruction book supplied with your Canon EOS 700D camera (sometimes only supplied online as a downloadable PDF guide). Finished book size is A5 (148 x 210mm). I am sorry to hear that the back cover has fallen off, I will send out a replacement booklet for you. A lot easier to use than the small manual that comes with the camera. Thanks.